For the review of the first book, Click Here. For the review of the second book, Click Here. For the Review of the third book, Click Here. 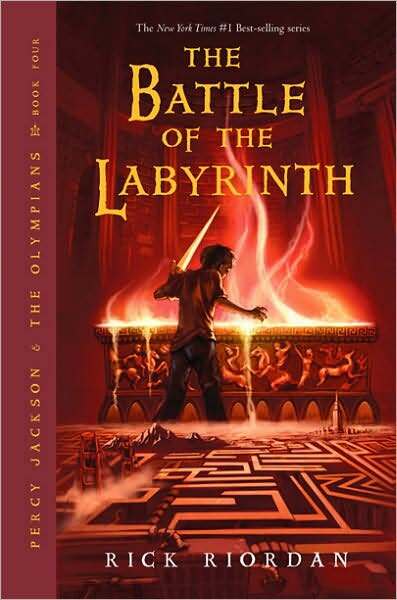 Demigod Percy Jackson is at it again in the fourth installment in this series. The book opens on Percy once again destroying his school by killing a mythical monster before taking off on his quest. This time he doesn’t leave alone, taking with him Rachel Dare, one of the only humans who can see through “the mist” which allows the gods, monsters and demigods to hide their identities. Percy heads back to Camp Half-Blood, which is supposedly one of the only places in the world where the demigods are safe. However, in this book, the rising Lord Kronos and his followers find a way to breach the magical boundaries of the camp. The only way Percy and his friends can stop the invasion is to venture into the Labyrinth (Yes, Daedalus’s Labyrinth) which still exists under the continental United States. What I have always liked about the Percy Jackson series is that they are EASY reads. No, I don’t feel like they make me a better person. No, I don’t really feel like I have learned something afterward (if you don’t count that sometimes I sat with Wikipedia open as I read so I could discover each god’s back story.) These books are the type of story I like to read when life is stressful. They are easy, humorous and they don’t take a lot of effort to process. The Battle of the Labyrinth was not my favorite in the series, but I liked it enough to read it and get through to the next book. I did love to see the relationship between Percy and Annabeth start to blossom and it was fun to see Percy start to grow up. There doesn’t seem to be as much face time with the individual gods in this book, which I missed because the small illusions to their back stories are often so humorous. I did like this book. It is not on my favorite list, but it is a fun read. I recommend it if you like mythology or fantasy books and you are looking for an easy read.